Without us being able to explain why, exactly, there is something very feminine and perhaps even something playfully feline about the art of Blandine Bardeau. The hint of a living creature with cream on its whiskers might not be that far off the mark. 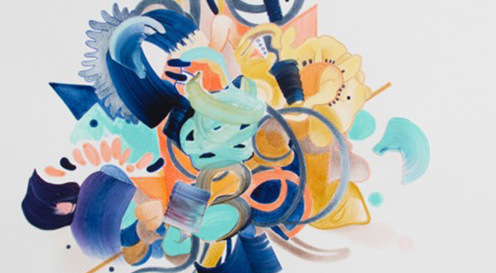 Although the art is abstract or semi-abstract, Bardeau refers to her work as jelly biomorphic amalgams or even better as copy-paste beings which are crawling out of their frames leaving behind traces of colour. It goes some way to explaining the equally light and dynamic compositions. They consist of elusive abstract beings that shift shapes at whim and for the sheer hell of it. The drawings hint at having been spun off of Bardeau’s training in fashion and jewellery which is arguably not part and parcel of a fine artist’s training, but undoubtedly gives her work a spice that that is missing from the rack with so many. She likes to use mixed-media techniques in all of her pieces be it acrylics, oils, acetates, paper cut-outs, latex, coloured pencils or felt-tip pens. 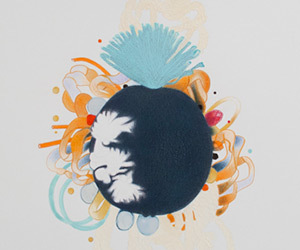 She collects magazine cut-outs and peels off dried acrylic shapes, or brushstrokes from paper or acetate. Everything is in the pot from the meticulous and time-consuming colour-pencil draughtsmanship to the freer collaging technique. The surface that receives this glory is mostly linen, translucent polyester and paper. Polyester has special properties, its transparency allows the artist to work both from the front and the back of the painting. There are many influences that are a testament to a stint in design. Biomimicry is a constant source of inspiration in much high-end design because nature has solved problems of structural integrity and reduced mass in a rather intelligent way. 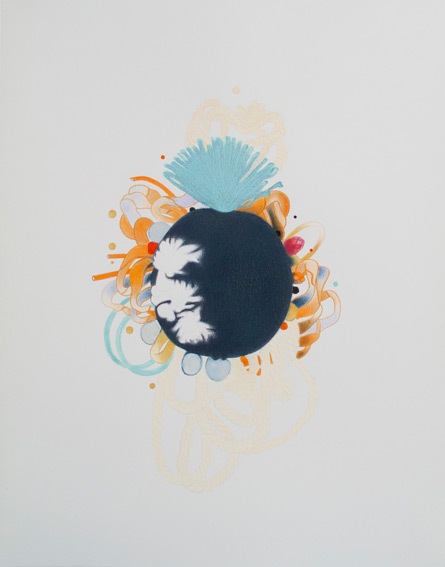 In the same way, the artist draws inspiration from organic shapes from jellyfish and plants. But she is a magpie collecting from everything and anything. Japanese calligraphy is one of them as is the animated spirit worlds depicted by Hayao Miyazaki in Howl’s Moving Castle and Spirited Away. Born in France, Blandine lives and works in Deptford, London where she is part of Artists Collective NOHO Artists. She completed a BA Fashion Design Womenswear at Central Saint Martins before embarking on an MA in Painting at the Glasgow School of Art. The move to Glasgow was a decisive move towards her love for Fine Art, mainly drawing and painting. During the course, she started creating soft sculptures, where fabrics and textiles were handled in a painterly way. All images by the courtesy of the artist.© Blandine Bardeau, all rights reserved. 2010: "Fluorescent Monkeys", Beyond the Valley Gallery, London. 2015: In Conversation", a co-curated show with NOHO Artists, Covent Garden, in partnership with Balthazart. 2015: "Painting the Future", DegreeArt Contemporary Collective exhibition, Vyner Street, London. 2014: Windsor Contemporary Art Fair, as part of Caiger Contemporary Gallery, London. 2014: "Precious" Deptford X, ArtHub Gallery, London. 2014: "Secret Art Prize Exhibition", Curious Duke Gallery, London. 2014: HUBBA BUBBA 2, Arthub Gallery, Deptford. 2014: SEE Art Fair, as part of artist collective NOHO Artists Assembly Hall Theatre, Tunbridge Wells. 2014: HUBBA BUBBA , Arthub Gallery, Deptford. 2014: exhibition of works at the Greenwich Tourist Information Centre. 2013: "Toastmasters Finland", Arkadia International Bookshop, Helsinki. 2013: Group Show at The Glue Factory, Glasgow. 2012: Mediakeskus Lume, Aalto-yliopisto, Helsinki. 2012: Group Show, Bermondsey Project Space, London. 2012: Masters Degree Show, The Lighthouse, Glasgow. 2012: Masters Degree Show, The Mackintosh Building, Glasgow. 2010: "Converse, You're here", Garage de Turenne, Paris. Represented by Caiger Contemporary Gallery and Curious Duke Gallery, London.